I’m so pleased to offer you an opportunity to sample my cakes! I offer tasting appointments for clients who need 100 servings or more. If you are expecting less than 100 guests and would like to sample my cake you can purchase one of my cupcake “tasting to go” packages. I provide four flavors of cake with filling for you to sample. The cake is topped with my signature buttercream and I will also have a sample of fondant for you to taste. There is a $25 charge for the tasting (due before our appointment). If you book your cake your cake with me I apply the tasting fee to the balance of your order (minimum order amount applies). You should have an approximate guest count before you schedule your appointment so that you can calculate if I will be able to provide you with a cake within your budget. My prices start at $3.50 per serving for buttercream cakes and $4.00 for fondant covered cakes. The final price of the cake is determined by the overall design. I want to help you stay within your budget as much as possible! I do offer undecorated kitchen cakes at a slightly reduced rate that can be paired with one of our tiered cakes. 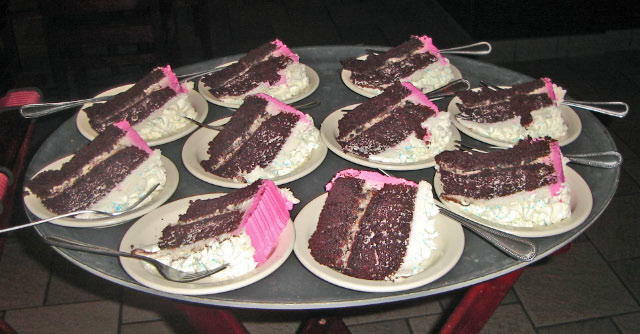 There is a minimum serving requirement for the tiered cake. You and your fiancé may invite one or two other guests to join you for a total of four people at the appointment. Please let me know how many will be coming so that I can prepare enough plates. Additional people may join you for $10 per person (due when you book the appointment). Plan on our appointment lasting between 60 and 90 minutes. Bring with you any ideas, pictures or designs of cakes that you like. It is also helpful if you have color swatches you would like incorporated into your cake design. If you have a Pinterest board you can send me the link ahead of time. So that we can focus on designing the cake of your dreams, please arrange for childcare during the time of our appointment. While I will make every effort to schedule your appointment as soon as possible, I do ask for at least two week’s advance notice, as all my samples are baked fresh and I will need time to shop and prepare. Please inform me of any food allergies at the time of scheduling. If you decide to have me create your wedding cake a 50% non-refundable deposit is required to book your date. You do not have to pay that at the time of the tasting. However, I do not hold any date without a deposit. Price quotes are good for up to 7 days after the appointment. If for any reason you need to cancel our appointment, please call as soon as you know you will not be able to make it. I am happy to reschedule as soon as possible.